We've featured plenty of fantastic fan art and posters before, but what I came across today is particularly awesome because it pertains to two highly anticipated upcoming DC Comics projects - Zack Snyder's Man of Steel and Christopher Nolan's The Dark Knight Rises. As we know, Chris Nolan is actually the link between the two, serving as producer on Man of Steel. Artist Al Pennyworth on deviantArt (via FYMP Tumblr) created two posters that hint at that link as side-by-side they form a spectacular diptych, one for Metropolis in Man of Steel, one for Gotham in The Dark Knight Rises. I just love this, check it out below! Click on either one to see them full-size over on his deviantArt page. Great work, I really want these printed. Pennyworth doesn't explain much behind his inspiration, but I'd say it's self-explanatory anyway. I only wish that Superman was a bit more visible on the Man of Steel poster, as I think that's him on top of the globe, but it would've been cooler to see him flying like Bats. He also designed a series of minimalistic posters for Marvel's The Avengers, which simply have an icon for each superhero - they're good, too. I just love that we're seeing fan artwork this fantastic this early on, since Superman: Man of Steel isn't out until June 2013 and The Dark Knight Rises in July 2012. And I love that these two look so perfect side-by-side. I'm sure this is only the beginning of lots of Superman and Batman fan art to come over the next two years. Man! Those must have taken him at least half a dozen minutes to make both those. Ohh come on, it's about the design and look, not the amount of time it takes to create them. Hell, you don't even know that anyway! I grew up around artists. You'd be amazed at how long it takes, meaning: you're right. This didn't get whipped out in 5 minutes. Disagree. Been around artists too. Looks like he got married to an idea - the shape of a city, the visual flow of a triangle - and stamped it on two seperate things. And he didn't work on the concept much, because I don't know about you, but when I think Superman I don't think Daily Planet. Are you saying it could have taken him less than 6 minutes to make those both? Because I said ≤ 6 minutes to complete. He changed the top of 1 building and pressed ctrl+u in photoshop to change the color of the BG. Color me unimpressed. With that being said I find minimalism to minimally enjoyable. in response to D Block, in terms of production time these posters maybe relatively low, however there is also the creation of the concept to consider. Often people over look this, they simply look at piece of work for its production values, not considering the length of time it takes to think, apply, construct, tinker...etc. Should we create movies/music without planning or preparation? As a creative I would argee to Alex's comments about the superman poster, perhaps the artist would consider putting something like superman shooting off into the stars leaving a red trail for obvious reasons. toodles. one is blue-green and the other is navy. it's not a simple case of just adding black. I'm confused: do they live in the same city? Meh, this strikes me as uninspired and lazy. And I don't care how long they took to make, that means nothing. Most of these posters seem to get by on the fact that they are so different from conventional ones. That's fair enough, but there is nothing going on in these two. Some folksy/crafty creased paper and watercolor fuckery, combined with some unsubtle use of negative space. boring. 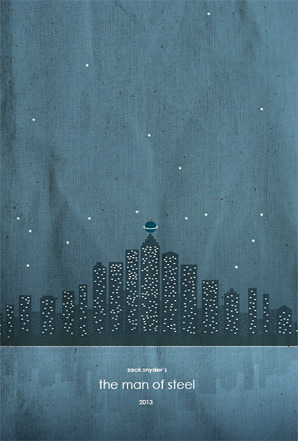 Im all for minimalist posters, but these are..well..less then fantastic. He could have varied the stars at least. I can see where the appreciation is laid, but it doesn't grasp me hard enough. Not hating, just having both at the same time seems lackluster. Like how long would it take for him to make a green lantern poster off this? c'mon, FSN. This just reads like a slow news day....or a favor. It's a very slow news week, its been slow since August 1st! 🙂 Not a favor, I just stumbled across these on Tumblr, don't know anyone. A poster is suppose to comunicate a message about the story of a film. 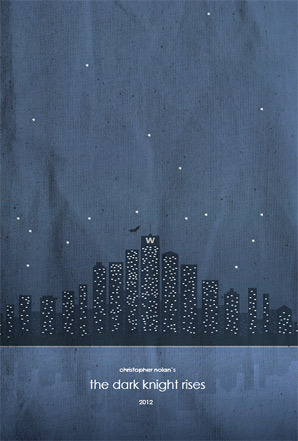 What do these posters communicate: That the stars shine the same over Gotham and Metropolis and/or that whoever designed these cities wanted the buildings arranged symetrically? Poor design choice in my opinion, sorry. Yes, but these are NOT official posters. They're just FAN ART, minimalistic fan art, it was designed from the start to include as LITTLE imagery as possible. I just think they're great designs that look great together, they don't HAVE to convey a message. Neither of these movies are out for another year, and we've barely seen ONE poster, so why rag on some fan art this early? Goodness gracious, frickin' cynical bastards. LOL... how do you deal with such inanity? No worries, that's totally fine, but just state that you don't like these, don't discredit the art and design in its entirety. Hi Alex, I just got linked to this article for my posters. Thanks for featuring them. I won't go into explaining my designs, I just wanted to thank you for having them up and I appreciate your feedback towards them. Why do I feel the urge to play Dominoes? So many cynics! I think these fan art pieces are great. They work together to show the duality between Gotham and Metropolis. Whether by laziness or design, the posters would be less effective had the stars been different.